Thrift Store Mama: We were never promised . . .
We were never promised . . .
"We were never promised a life without suffering." Recently, I was at a women's prayer group in my neighborhood, an eclectic group of denominations and social groups. My friend spoke these words "We were never promised a life without suffering" and in that moment, I felt so comforted, because my mind and heart were torn up in my own thoughts and my own worries and in trying not to think about it and not to worry. Worst of all, I wasn't telling anyone what was going on, because to tell would have made it a "thing" and to not tell, to not speak of it meant that it was not a "thing" - nothing more inconsequential than the splinter in a finger. Because if anyone gave me sympathy or expressed worry it would simply be too much for me to handle. It would mean that there was something to be scared of. And I just couldn't deal with that. 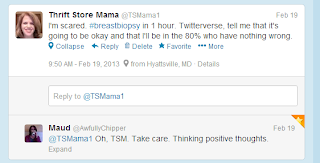 After the first mammogram, I had phone calls from the radiologist's office and my doctor's office. During the second (diagnostic) mammogram when they wouldn't let me get dressed . . . when they kept doing "just another picture, just another view" . . . I got a little bit worried but not too much. After all this was my baseline and they just wanted to map and chart everything so that they knew exactly what it was. Even when the radiologist came in to the room and said she wanted me to make an appointment for a biopsy, I still wasn't overly concerned. I was mildly freaked and cried a little when she left me, but I still kept thinking "they just need to know what everything is, this is just a baseline, don't get ahead of yourself, don't worry." The very next day when I was at the ob/gyn's office, sitting across from the same kind man who delivered Beezus and Ramona, it was then that I was scared. Because as I was sitting in his office and he came in and we said hello and made small talk, he suddenly looked straight at me and said "the radiologist called me yesterday afternoon." it was then that I felt a cold chill passed through my body, because for one doctor to pick up the phone and call another doctor suddenly made this into a "thing." Still, I persevered in my silence and in my efforts not to worry. I spoke of this to no one: not my husband, not my sisters, not the warm and wonderful women that I have formed such close relationships with over the years. Then came the prayer group. It was in that moment, when my friend reminded us that we weren't promised a life without suffering, that I was no longer afraid to worry. For this worry, this unknown, this suffering is the very same stuff that life is made of just as surely as laundry or wiping bottoms or working is. So, I let myself worry. I mentioned it to a couple friends. I let it become a small "thing." The morning of the biopsy as I was sitting in the parking lot at the hospital, I couldn't bear it alone. I tweeted and a friend responded. And I felt better. Then, I prayed. I prayed for comfort. I prayed to not feel alone. I asked Susan/WhyMommy to intercede on my behalf, just as the priest at her funeral said we could. And then, as surely as I am sitting here writing this today, I felt an arm slip around my shoulders from my right and then another arm slip around my shoulders from my left. They were firm and they were warm. Then, as I asked intercessions of other loved ones in heaven, I felt their hands rest on my head and on my back. I let myself sit in my car and cry and worry . . . but I did not feel alone anymore. Then I dried my eyes, got out of the car, and walked in. Fast forward two weeks, to the present day. This calcification, this "suspicious area" was found to be benign, as are 80% of calcifications. I didn't need to worry - but I did and I found comfort when I needed it most. Oh, I had no idea. I am so relieved for you. Imagine me hugging you as well, friend. Oh, thank heavens. The waiting is horrible. There should be a better way. So glad this turned out the way it did. Many hugs to you. Oh my goodness, I'm so glad to hear that all is well. The waiting is horrible, isn't it? I am just reading this post now and I am so grateful that everything is OK. I look forward to a big hug when I see you next time. Oh my heart, Ellen! I'm so far behind in my blog reading - I had no idea! I'm so glad it was benign, but I so know that's "It's going to be ok, it's going to be ok, it going to OMG I'm trying not to freak out" feeling. I'm sorry you had to go through that. Relief. What a frightening experience. So glad you found comfort when you needed it.